In the era of technology, this Father’s Day, let’s gift our dads with simple, quirky and handmade Father’s Day Cards and make him feel like a Prince. The best gift for a father is when his kids gift him presents made all by themselves. Cute and funny drawings with their creative minds and fingers and memorable cards with words from the bottom of their heart are present’s which dads can hang or keep it in his regular work space. Are you planning to surprise your dad with something exclusively for him? Are you looking for some creative and unique ideas and inspiration to gift your dad cool and handmade father’s day cards? Scroll along to get de-clutter the confusion in your mind. A gift is close to a heart when it is handmade and personalized. A handmade greeting card is the best way to appreciate your Dad’s love for you and make him feel special. Here are top 6 quirky ideas to design and make a handmade Father’s Day card for your hero. If your dad loves melon, this Father’s Day card would be ideal dedication and gift for him. Materials Required: Googly eyes, White Glue, White Poster Board or Cardstock, Scissors, Black Marker, Pencil, and Black, Pink, Red, Light & Dark Green Craft Foam Sheets. Method: Get the watermelon template printed on a thick sheet. Cut the template and trace it on the red craft foam sheet and cut it out. Once done, stick the melon onto the white poster board or cardstock. Now, cut the bottom portion of the melon template. Take the green craft sheet and trace the bottom portion and cut out. Stick it on the bottom of the red portion. Cut the smaller rind from green craft foam sheet and stick it to the dark green sheet. Glue on the google eyes. Cut the pink sheet into small pieces and stick it as a pink cheek near the googly eyes. Using black marker draw the black seeds. At the top and bottom, write your special message for your dad. And the fruity card is ready! Does your dad love fish or adores fishing? If yes, this fishy father’ day card is just THE idea to design a special card for him. Method: Take a blue paper and cut into 7”X10” card. Take the mini scoring board and score five inches on the 10-inch side and fold at the crease. Using a heart punch, make two hearts. Break one heart down at the center to make two fins. Score the heart down the center with the mini scoring board. Using jumbo circle punch, make a circle. Punch again on the circle to make an oval shape for the fish’s body. Cut out the eye using a screw punch. Using scissors, cut out a small triangle. Take 5”X4” paper and make a small circle and cut half-circles along the 5-inch edge to make wave shapes. Using the jewelry wire, make a small piece of wire and attach a baker’s twine for the line. Collect the pieces and stick together using a glue pen. Use the glitter pen to write your message for your loving dad. These uber cool handmade glasses are funky as well as personalized for your dad. Make it cool for your father. Things Required: Black color templates, cardboard, craft knife, and glue pen. Method: Cut the letters from the printed template. Take the cardboard and trace the letters using your favorite color. Using the craft knife, cut the lines carefully. Fold the tabs and stick the frame of the glasses. The uber-cool handmade glasses are ready to wear. Pop them into a gift bag and present it to your dad. Most fathers love cuff-links. If you are dad also loves, these cuff-links card would be very cute and interesting idea. Things Required: Buttons, scissors, glitter pen construction paper, 24-gauge wire, needle nose pliers. Method: Take the construction paper and cut it into 3 ¼ by 9-inch and then round two corners. 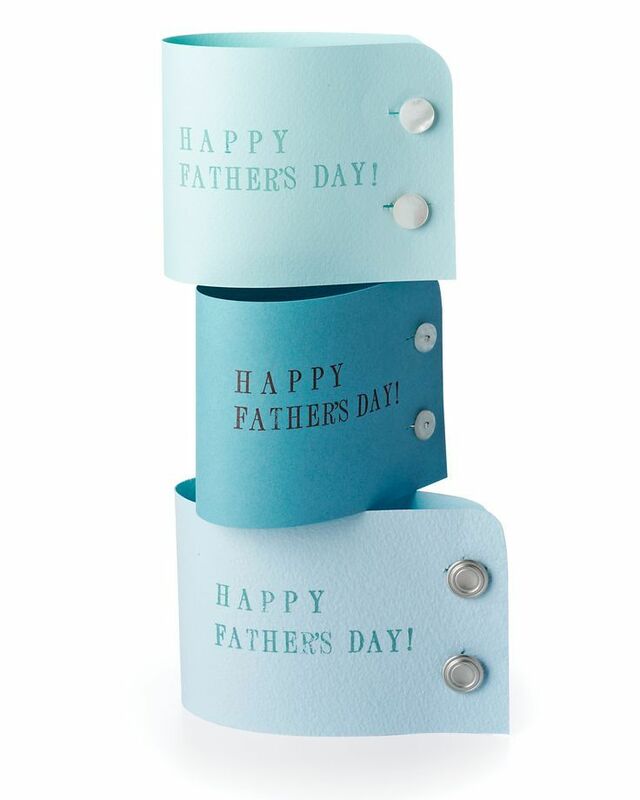 Write your message for your dad on the side and bend the paper into half gently. Using scissors cut four slits for cuff-links. Using the 24-gauge wire hooks it like a cuff-link onto the button’s shank and tighten it with a needle nose pliers. Cut the wire into a half inch and loop through the second button. Repeat the procedure to any number of papers. And your cuff-link card is all ready to be gifted. This one is the really cutest card and every dad would love it to his heart’s content. Things Required: White and blue construction paper, glue and a sketch pen set. Method: Take the blue construction paper and fold in half and mend the edges and grease it to stiff it. Take the white paper and cut into a small size and stick it on the front side as shown in the image. Now using the sketch pen, write Google as seen in a typical browser in a colorful fashion. Draw three boxes using a black pen representing the search bar. 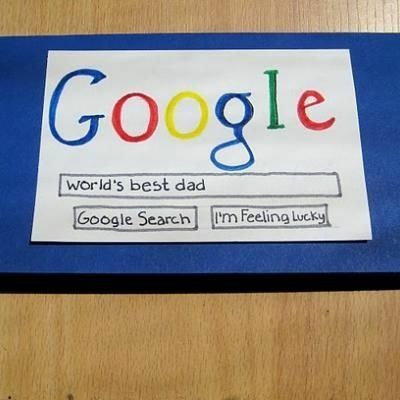 And write, ‘World’s Best Dad’ and your message for him. Take the image as an inspiration and create your own card. Write a slam book or questionnaire type card and design it all by yourself and express your love for him. Things Required: Glue, scissors, white construction paper, template of the questionnaire of the candy wrapper, scale, color pen, and pencil. Method: Take a printout of the candy bar wrapper questionnaire in the form of a tie. There are templates available with questions. Cut the printout as a tire. Take the white construction paper and draw two horizontal lines and cut them and carefully fold them toward the diagonal folds guides. Open the collars back up and stick using the glue on the top edge as shown in the picture. Press the collars down and hold them tight till it sticks. The shirt collar is ready. Take the tie candy wrapper and stick it in the center of the collar using the glue. To turn the shirt card into a pocket or wrapper to hold a candy bar, add glue to the three sides of the back piece as shown above. Place the front piece on top aligning the bottom and side edges. Leave it aside for a few minutes to dry. Once dried, fill the form using color pens or markers. Are thrilled to start the personalized card for your dad? These simple and cute little ideas can be done by kids as well as adults. This Father’s Day lets honor our dads and take them to the cloud nine of the world.